Cardiovascular diseases remain the major cause of death in the developed world. The costs generated in economic, social and human terms are immense. This has led us to propose this line to further understand the biology and basic mechanisms underlying cardiovascular diseases, identify potential novel targets, apply the information and concepts available in clinical studies of patients and, develop other biotechnological novel applications to prevent them. In this context our group has proposed new acquisition methods for MRI, CT and PET cardiac studies in order to reduce acquisition time, reduce radiation dose levels or even obtain cardiac gated images without external ECGs devices. 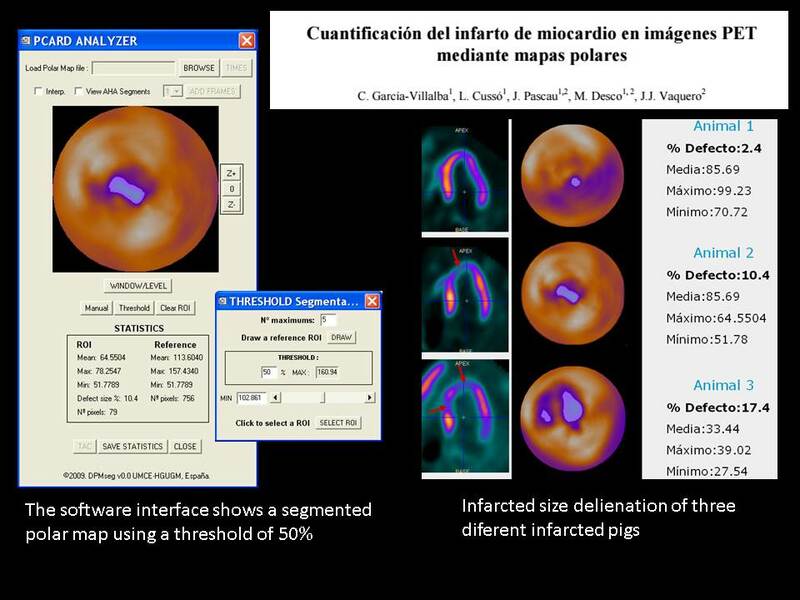 We have developed an algorithm for automatic segmentation of dynamic PET images and a software to measure infarcted areas using PMODE polar maps from PET images. 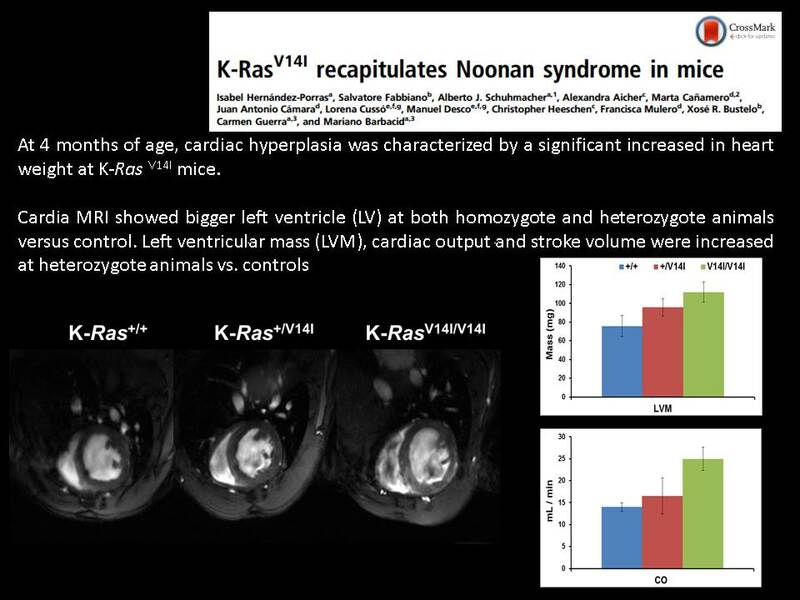 We strongly collaborate with many research institutions (CNIO, CNIC, and URJC) evaluating a variety of cardiovascular animal models, such as Noonan murine model, diabetic fatty rats and myocardial infarcted rats, by molecular imaging techniques. Abascal, J. F. P. J., M. Abella, et al. (2015). "Investigation of Different Sparsity Transforms for the PICCS Algorithm in Small-Animal Respiratory Gated CT." PLoS One 10(3): e0120140 (0120118 pp.). Vaquero JJ, Montesinos P, et al. 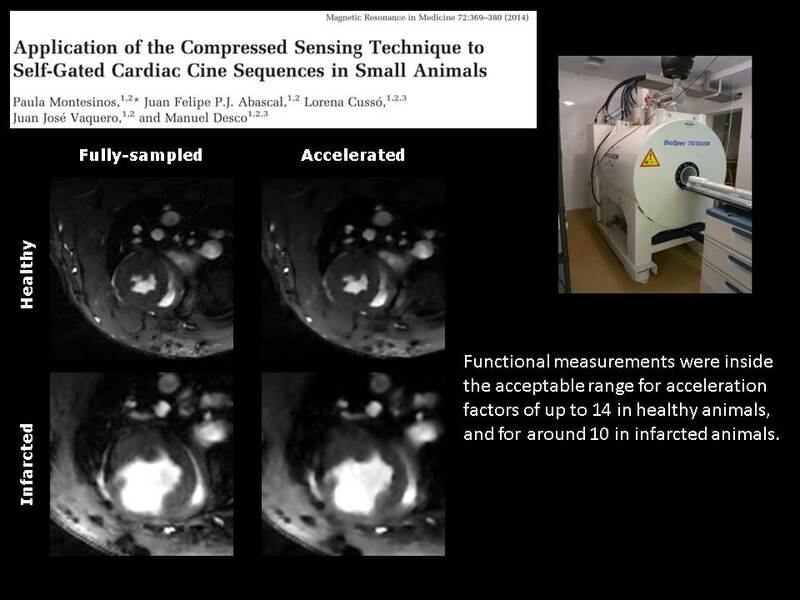 (2014) In-line high resolution PET and 3T MRI hybrid device for preclinical multimodal imaging. EJNMMI Physics 1(Suppl 1):A7. López-Miranda V, Cussó L, et al. (2011) Cardiac disturbances in zucker diabetic fatty rats: effect of a chronic resveratrol treatment. Journal of Diabetes. pp. 212-213. Herraiz JL, Vaquero JJ, et al. (2011) Automatic Self Gating of Small-Animal PET from List-Mode Data. IEEE Nuclear Science Symposium and Medical Imaging Conference (NSS/MIC). pp. 237. Mateos-Pérez JM, Vaquero JJ, et al. 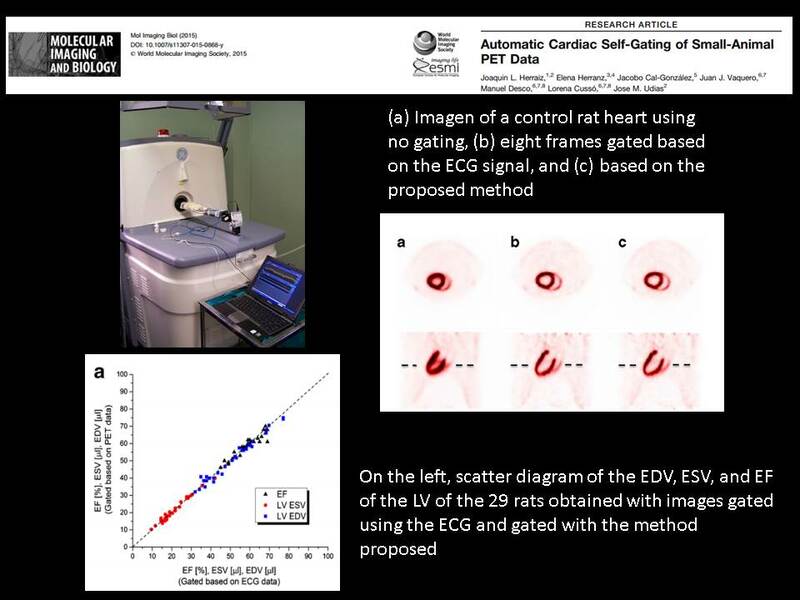 (2011) Leader-follower clustering algorithm for automatic segmentation of cardiac PET studies. IEEE Nuclear Science Symposium and Medical Imaging Conference (NSS/MIC). pp. 3133-3136. García-Villalba, C., L. Cussó, et al. (2010). Cuantificación del infarto de miocardio en imágenes PET mediante mapas polares. Proceedings del XXVIII Congreso Anual de la Sociedad Española de Ingeniería Biomédica (CASEIB): s.p. Cussó L, Santa Marta C, et al. (2009) Multimodal assessment of myocardial infarction in rats: comparison of late gadolinium enhanced MRI and PET. Abstract book of European Society for Molecular Imaging (ESMI). pp. 104. Vaquero, J.J. (2013-2016). Red Cardiovascular (RIC). RD12/0042/0057. Ministerio de Economía y Competitividad. Vaquero, J. J. (2009-2014). RECAVA (Red Temática de Enfermedades Cardiovasculares). RD07/0014/2009. Ministerio de Ciencia e Innovación. Abalo Delgado, R. (2010-2011). El resveratrol, un nutricéutico fundamental de la dieta mediterránea, frente al síndrome metabólico y sus complicaciones. Fundación Mapfre. Desco, M. (2007-2010). Desarrollo de tecnologías para imagen molecular multimodalidad. TEC2007-64731/TCM. Ministerio de Ciencia e Innovación. Vaquero, J. J. (2005). Validación de la técnica multimodalidad en imagen molecular: aplicación al estudio in vivo de procesos biológicos en animales de laboratorio. GR/SAL/0241/2004. Consejería de Educación. Comunidad de Madrid.